would eventually meet her book-designing husband, and raise their two spunky children. The family later moved to Portland, Oregon which they continue to call their home. 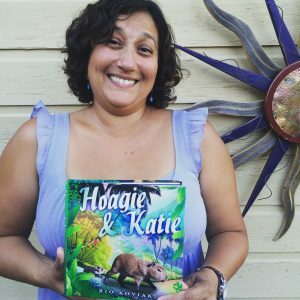 Hoagie & Katie is Rio’s first children’s book which she hopes to serialize and develop as an audio book with rich vocal characterizations. When I was around 6 yrs old, I started writing, performing, and recording my own stories on my mother’s 8-track stereo. By the time I was seven, I became obsessed with observing people (basically, spying), and every chance I got, I would log my findings in a locked diary which I kept hidden beneath my bookshelf. Soon, I graduated to journal entries about my observations of others, as well as chronicling my own experiences (both pleasant and woeful). Lately, I have inspired by my children and their little friends. I love to see their faces light up when I have a new story to tell and new voices to experiment with. It's so satisfying to hear that they can't wait for my next book to come out! I feel especially connected to my main Hoagie & Katie characters. Since it is a series and audio book, I have become familiar with their personalities, and ways of speaking. Whenever I write an additional book, it feels like I'm coming home to old friends. Find what type of genre you are good at and love doing, then get to know your audience. Start reading small pieces to your selected readership to get constructive feedback (or simply noticing what works). Originally, my first book was supposed to be an experiment and side hobby for my husband and I to do together. ultimately, I decided to self-publish because once I had a finished product, most publishers didn't want to touch it, wanting me to start off from scratch. While the natural photographs of my characters were supposed to be temporary, I found that most of my audience (parents included) preferred that method of imagery, and I was not willing to give that up. At one point, I was concerned about the future of book publishing. I was fearful that ebooks were going to take over, and the printed page would become extinct. I no longer feel that way, as it is evident that there will always be those who prefer reading a genuine book held in their hands. Professional publishing has become more competitive, therefore, self-publishing has become more prevalent. There is more helpful information out there for newbies, which has made less daunting.